Students protest outside the Lake Champlain Chamber of Commerce. 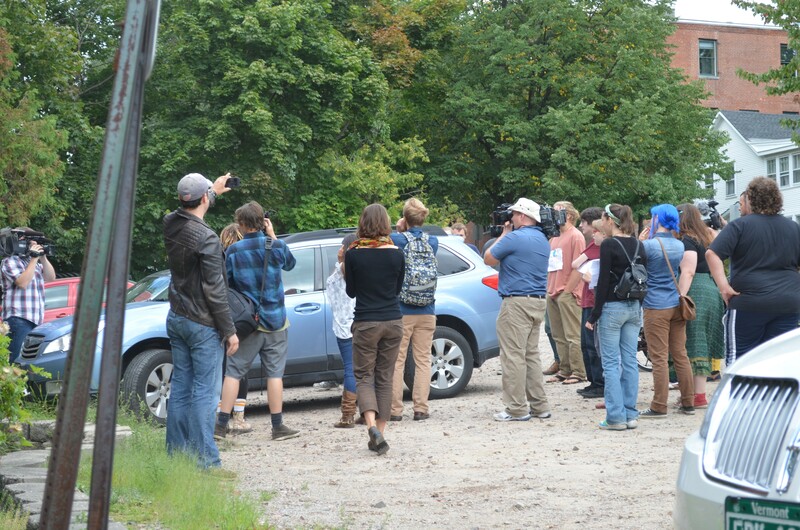 After briefly trying to quell the crowd of chanting Burlington College students who surrounded her car Friday morning, the school's president, Christine Plunkett — clearly flustered — told them what they wanted to hear: "OK, I resign! Happy?" The students cheered, hugged one another and dispersed, allowing Plunkett to drive out of the parking lot. "I do not believe Christine is resigning," said the board chair, Yves Bradley, reached by phone after the meeting. Emphasizing that the board remains "in full support" of her, Bradley said he had not spoken to Plunkett since the students confronted her but had been apprised of the situation. "I think she was ambushed," he said. The college's spokesperson, Coralee Holm, told reporters "I'm not confirming anything," and she did not return phone calls later. 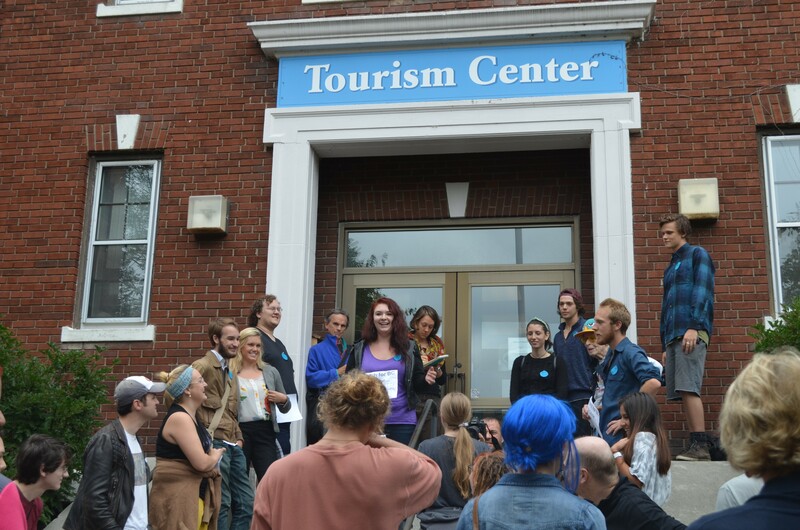 Approximately two dozen students had marched roughly one mile from the college to the Lake Champlain Chamber of Commerce, where Plunkett and the Burlington College Board of Trustees were meeting. Before starting off, they’d walked the hallways of the school, trying to recruit professors to come with them. At least two did. “When 20 of them show up at your office door, it’s kind of hard to say no,” explained Piers Kaniuka, who chairs the college’s integral psychology program. Stationing themselves at each of the chamber building's four exits and chanting "Hey hey, ho ho, Christine Plunkett's got to go," they waited for an hour until Plunkett and Holm came out the front doors a little after 11 a.m.
Students surround President Plunkett's car outside the Lake Champlain Chamber of Commerce. They followed her as she walked to her car, got in, and shut the door. Unable to back out of the parking lot because students were blocking her way, she opened her door and tried to schedule a time to meet with students at her office next week. "I've got a college to run," she said in response to students demanding that she talk to them there. Burlington College is facing financial problems that led a regional accreditation group to put the school on probation earlier this summer. Several weeks ago, a majority of the faculty and staff union and 68 members of the student union took separate votes of no confidence in Plunkett. Students have criticized how Plunkett has run the school and the way she communicates with them, and they accuse her of creating a culture of fear among faculty and staff. Two first-year students — Benjamin Gilbert and Brittany Shearer — also joined the protest. Shearer had been surprised to learn of the college’s financial troubles — “I didn’t even know until orientation.” Gilbert said he saw something on Wikipedia about the college being put on probation. Board chair Bradley said he was alarmed by the student demonstration and considered it counterproductive to the school's efforts to recover from its financial problems. “It’s certainly a voice that needs to be heard but it should be constructive.” The president, he continued, "was confronted with an extremely difficult and aggressive situation." According to Bradley, “the board is doing everything it can to bring the situation under control” and it’s been “extraordinarily active in the day-to-day operations” of the school. Students created the student union after disbanding the formally recognized student government in protest of faculty and staff layoffs that took place under Plunkett's leadership last fall. Bradley sent a brief email to the student union after their vote, suggesting that they pursue formal recognition and attaching a copy of the board's response to the faculty and staff, reiterating its support for Plunkett. Students say the board disregarded their opinion and they were protesting in a "demand to be heard." Friday marked the fifth day of fall semester classes at Burlington College.